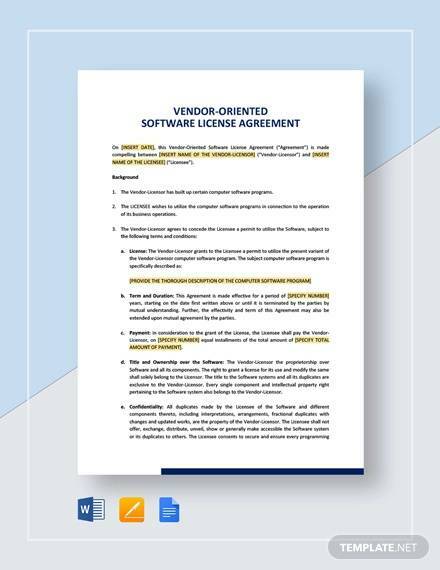 A software License Agreement involves licensor and purchaser where the licensor agrees to license a software product to a purchaser under certain terms and conditions. 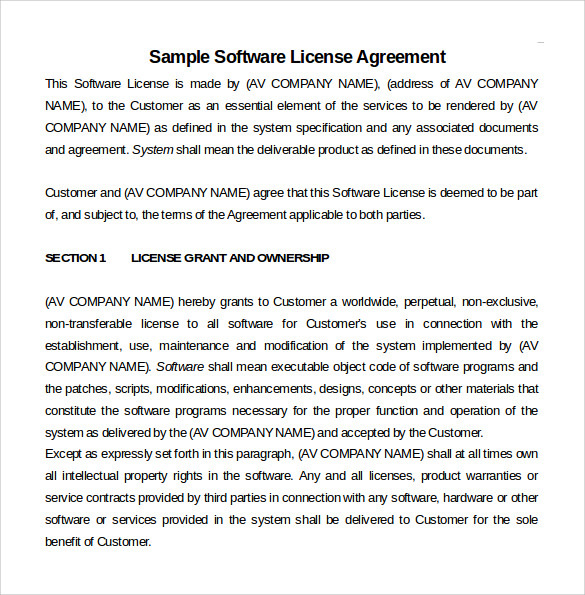 A License Agreements allows the purchaser to download the software in one or more computers, install the license key for the licensed product in the computer and use the software specifically for the purpose for which the software is created. The terms and conditions mentioned in the agreement are very vital where the licensor mentions all the restrictions to be abide by the purchaser and duration of license. Sample software license agreement available here guides a user to write the most perfect agreement in this matter. 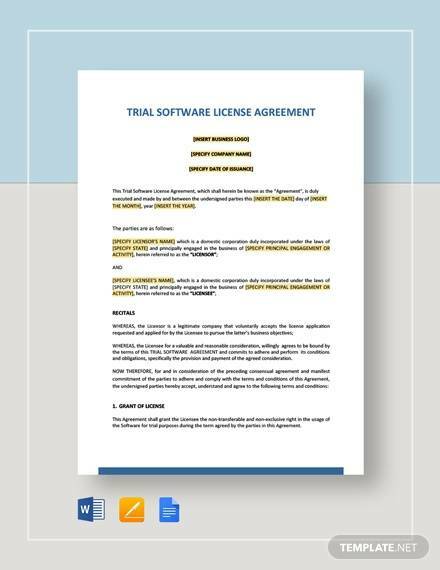 This software license agreement template helps people to write a perfect and useful agreement. 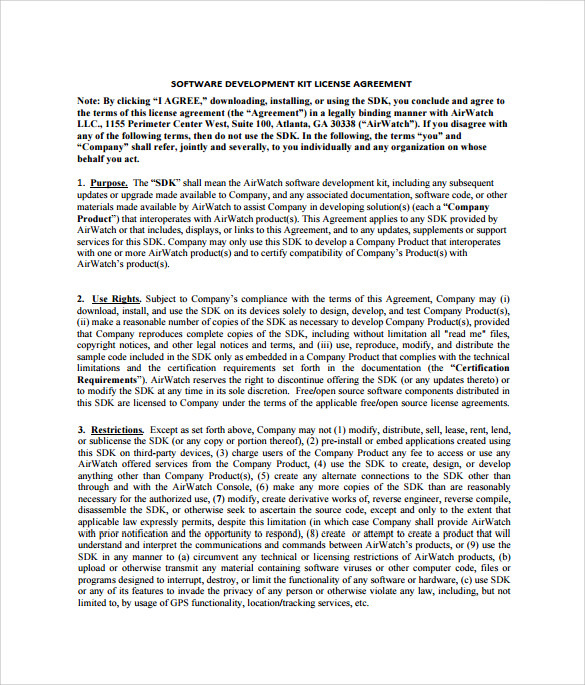 In this template, there are various statements where details like the date of the agreement, the name of the two companies involved, terms and conditions regarding the agreement, etc. This template can be effectively used by people, who want to make agreements. In this template, there are two parts. The first part describes the name of the company, their address and the usefulness of this agreement. The second part describes the terms and allowances the customer will receive. This template can prove to be essential in making a successful agreement. In this template, there are various conditions and instructions which the licensor wants to convey to the purchaser. These can provide ideas while designing a software license agreement. 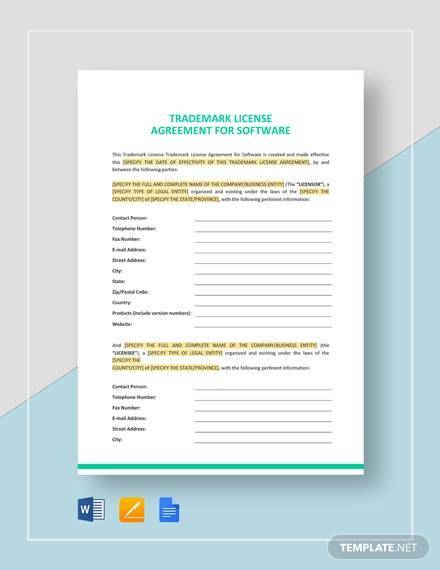 These templates provide people with ideas and examples of how to make a perfect license agreement. In this template, there are various rules and instructions, which are provided by a licensor to his client. Users can take this template’s help to make agreements which will suite both him and his client. 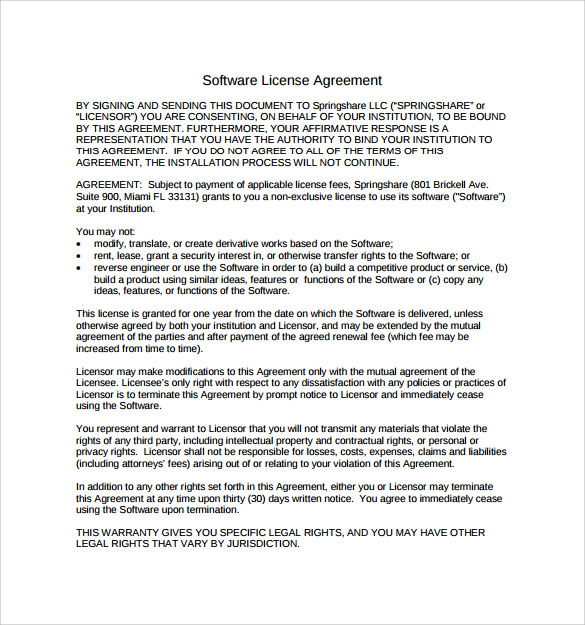 Why Do People Need Software License Agreement Templates? 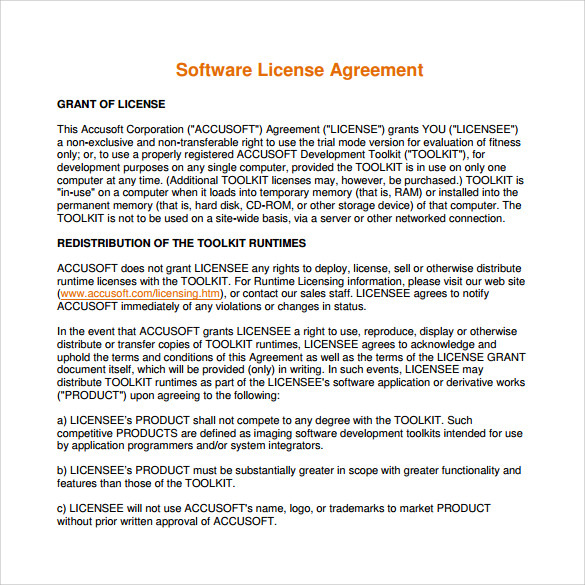 Software license agreements involve two parties: licensor and purchaser. 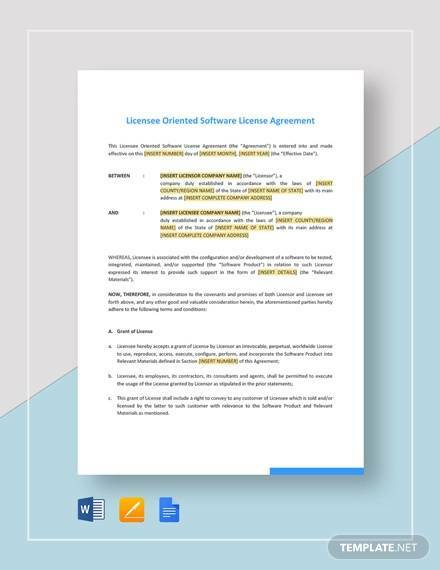 The licensor agrees to license his software to the customer under few terms. 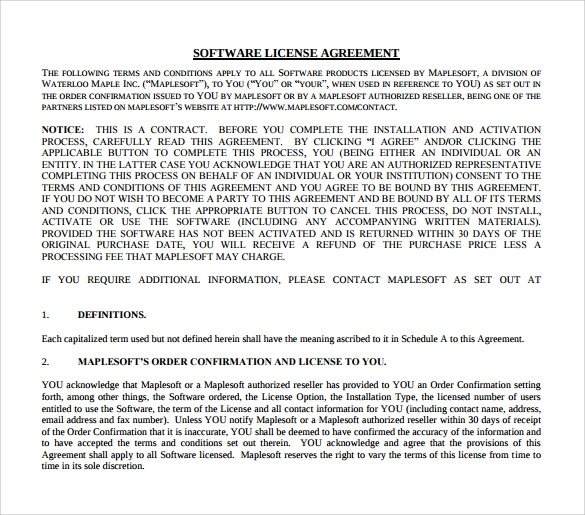 These software instructions allow the licensor to sell his product to the purchaser. 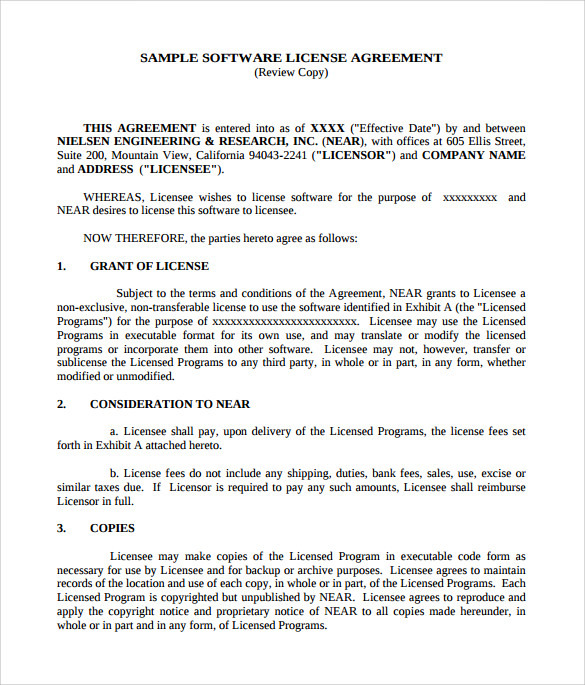 Software License Agreements allow purchasers to download the software on their computers or any other device, as well as use the software particularly for the purpose for which they were created. These license agreements should be made in such a way that both the licensor and the purchaser remain happy with it. 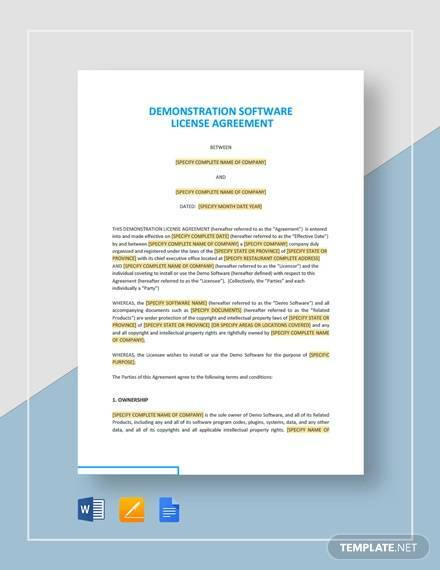 These software license agreement templates help the licensors, to know what type of terms they can use as well as how to use them properly. 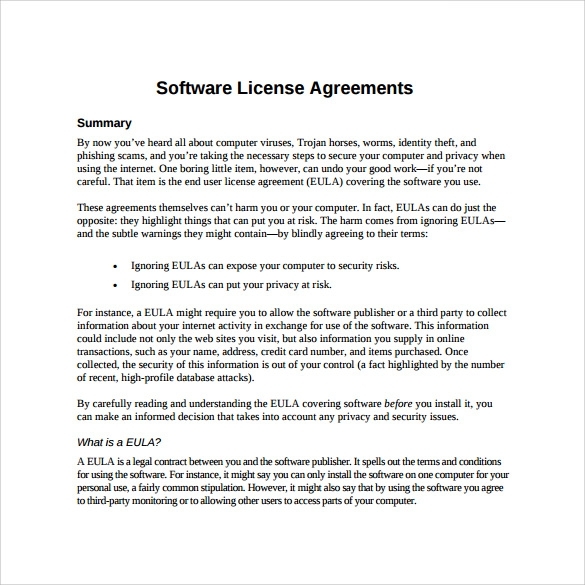 When Do People Need Software License Agreement Templates? There are mainly two parties involved in a license agreement: a purchaser and a licensor. The licensor makes certain terms and conditions and sells his product under those terms and conditions. The purchaser needs to download the software by agreeing to those terms and conditions in their computers or laptops or any other devices and also use them. So, while creating a license agreement, licensors can take the help of these templates for creating a perfect agreement, where both the parties will agree. Whenever licensors do not have an idea of how to create their agreements, they can take help from these templates. You may like Software Development Agreements. As in a license agreement two parties are involved, the agreement must be made in such a way which will satisfy both of them. The terms and conditions must be formed in such a way that licensors are happy with them. On the other hand, purchasers should also be happy with them and buy the product to use them. 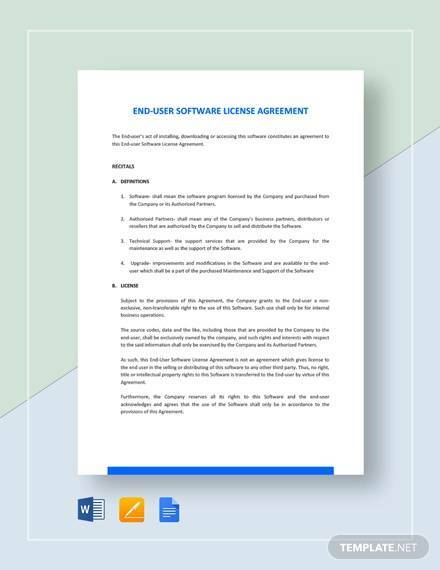 The biggest benefit of the template is that it helps the licensors to gain an idea on how to accurately create a license agreement in the correct format, with terms and conditions, which will satisfy both the parties. 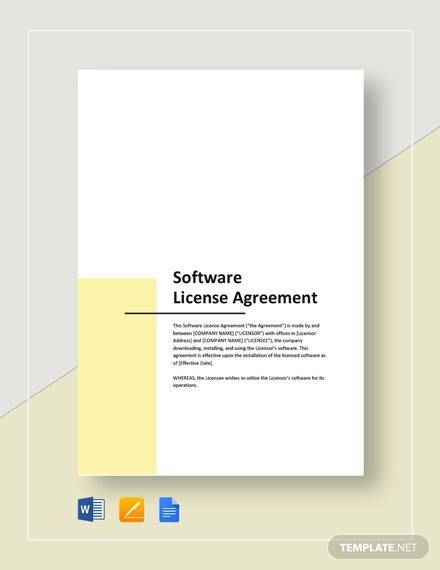 In a software license agreement, there are two parties involved – the licensor and the purchaser. The licensor makes some terms and conditions, which have to satisfy both the parties for the agreement to take place. These templates provide the licensors, with suggestions and ideas of how to create perfect agreements.